Established in 1990, the Alessandro Palace has become one of the most popular hostels in Rome for backpackers & independent travellers worldwide. The Alessandro Palace Hostel provides energy-saving air-conditioning & heating units as well as bathrooms in every room. Located in a safe central area, Alessandro Palace Hostel is a short walk (5 minutes) from Termini, Rome's central transportation hub for buses, metro, taxi stops, and trains to get you where you want to go. The Alessandro Palace Hostel is one of the few hostels in Rome to have its own onsite pub with satellite TV & the cheapest drink specials in town. 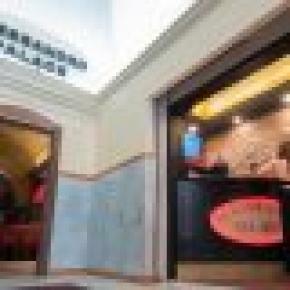 Furthermore, Alessandro Palace Hostel is a proud selected member of Europe's Famous Hostels. 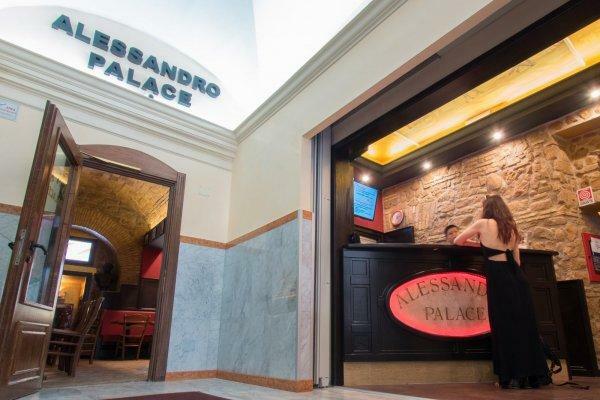 Alessandro Palace Bar boasts a traditional Roman style architecture & atmosphere. Michelangelo’s masterpiece “The Creation” painted on the ceiling welcomes you along with our friendly bar staff. It is the perfect place to sit back, relax and chat with fellow travellers over a beer! A wide screen TV and surround sound speaker system keeps you entertained with all the sports & music until late. The bar offers wi-fi connection, special events: parties, games, the cheapest drinks in town and happy hour every night. Bar open from 6pm until 2am (last call 1:30am) every night! * NEW!! Alessandro Palace ANNEX and it’s new private rooms!! We are happy to announce our brand new rooms at the Alessandro Palace ANNEX. Just 1 min. walking distance from the main Alessandro Palace. All rooms are equipped with TV, mini-fridge, A/C, wi-fi, and lockers or safe. There are both types of room, either ensuite or with shared bathroom. • FREE & FAST Wi-Fi (hotspot) is now available in all rooms and common area! • Lockers available in all dorm rooms! • Our DOUBLES become more comfortable with TV & Mini-fridge! Colosseum, Roman Forum, San Pietro in Vincoli, Basilica Santa Maria Maggiore, the shopping Mecca Spanish steps, Trevi Fountain, the classy Via Veneto can all be reached on foot in half an hour approx. * Airport pick up arranged upon request. Fee for 1-4 persons with 4 suitcases: from 57 Euros (for a car). 2. It must be requested least 3 days prior to arrival as we need to check availability. * For further details, please inquire by e-mail AFTER making reservation! Our reception is open 24 hours a day, so there are no curfews. There is no lock-out during the day, but we do ask that you help our cleaners out by staying out of their way as much as possible during their work. Cleaning hours are from 10h00 until 15h00. You may check-in or check-out at the front desk at anytime. Therefore you can leave your luggage at our luggage deposit (ask at reception upon arrival). Please make sure to inform us of any changes of your arrival ! Those with a late flight arrival need not be concerned, as reception is open 24 hrs. * Group reservations with the number of guests in excess of 8 people are NOT acceptable through the on-line reservation system. * Heating & air conditioning are on energy-saving timers. ** In storage room. Provide your own locks or purchase one from the vending machines. 예약일로부터 2일전에 취소가 이루어져야 하며 이후의 경우 1인당 1박 요금이 청구됩니다.